During their time there, many tourists opt to travel up the volcanic isle’s famously steep steps using a traditional, yet increasingly controversial, means of transport: riding on the back of a donkey. Many see this as an authentically Greek part of their experience, never considering the damage they could be inflicting upon the health of the donkeys. 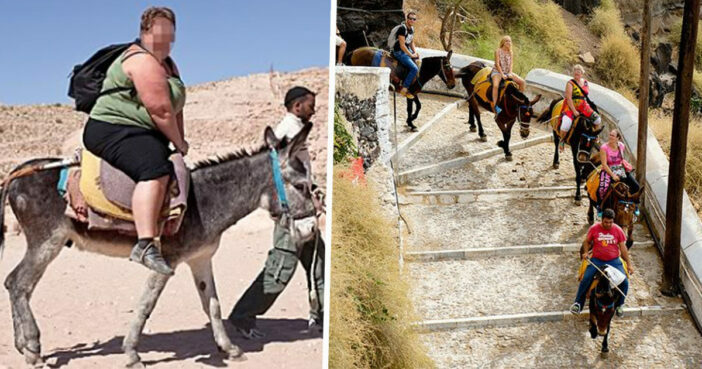 Demand for Santorini donkey rides has risen in recent years, reports The Guardian, with a marked increase in tourists heading to the island from cruise ships. This over-tourism has put pressure on the Santorini donkeys, leading them to suffer from health problems such as spinal injuries, saddle sores, and exhaustion. A campaign has now been launched by animal welfare and rescue charity, The Donkey Sanctuary – entitled ‘In Their Hooves’ – which encourages tourists to consider the welfare of these donkeys. In October, Santorini banned those weighing over 220 pounds – or one-fifth of the donkey’s weight – from riding them. As of this year, Santorini has capped cruise ship arrivals at 8,000 travelers. There are plenty of ways to enjoy the unique beauty and culture of Santorini without risking the health and well-being of these sweet, hardworking creatures. It’s good to see steps being taken to protect these iconic donkeys, with tourists being encouraged to be mindful and respectful when pursuing ‘authentic’ experiences.